Happy Sunday, I hope you are now well into your Christmas preparations. I still have quite a bit to do, but we are getting there. 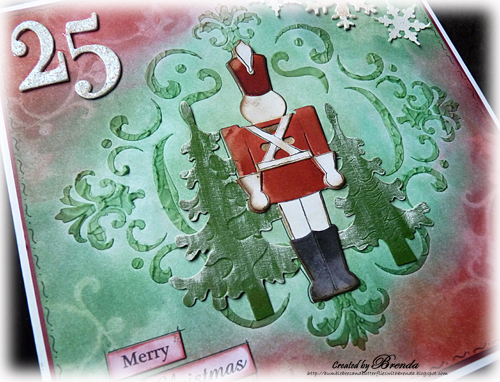 Today I have one post for both Fashionable Stamping Challenges and PanPastels DTs. The challenge today at FSC is 'Mask It' and at PanPastels it is 'Christmas Time' and by putting them together I have made a Christmas card for my hubbie. I used a mask and Maimeri modelling paste, available from our sponsors 'Your Creativity Store', to create the texture on the background and then when it was dry I added PPs and also used a holly mask to create further interest. 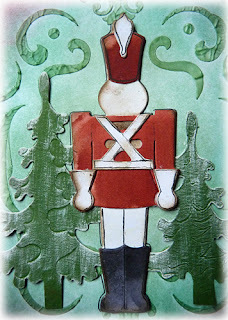 The toy soldier is a Sizzix die coloured with distress stains, inked round the edges and edged with black pen. The Marianne trees have been dry brushed with white paint and I created texture on them by using the die for embossing over them to make it look like branches. Finally one die cut and two punched snowflakes, a die cut 25 and computer generated sentiment complete finish it off. I am not around again today, I will be attending day 2 of the Andy Skinner workshops at The Stamp Attic. I am looking forward to having some time over the Christmas and New Year to play with the techniques I am learning. Sorry I haven't been commenting this week. The catch-up with work after my holiday, a day being a governor at a local school and then prepping and doing a workshop at The Art of Craft has prevented me from doing much else. But hopefully I can catch up with you all this week. Take care, only 10 more sleeps before Christmas. just adorable! I love it! Ooh what a fabulous card.. your hubby will love it I do.. the background is awesome. Hi Brenda...such a perfect card to give to a male! The texture paste is a great way to mask, it brings everything forward instead of backwards...a great idea! This is a real head turner Brenda as soon as I saw it I fell in love with it. Who cares about giving to a male I would have this one in an instant. A beautiful card with a wonderful image. Oh, I really like this one....the colour combo, and the different techniques for the texture. Beautiful! Love that striking background. The "Toy Soldier" looks as if he is standing on a candy cane cloud! Ken will love his Christmas card! I think I may just use that die for Steve's! Hope you are having a great time with Andy Skinner! Hugs! Fabulous background masking , love that Toy Soldier, great card for the man in your life, but like Shirley said, many women would love it as well. A wonderful blast of festive colour and with that amazing background. Hope you are having fun at the workshop. 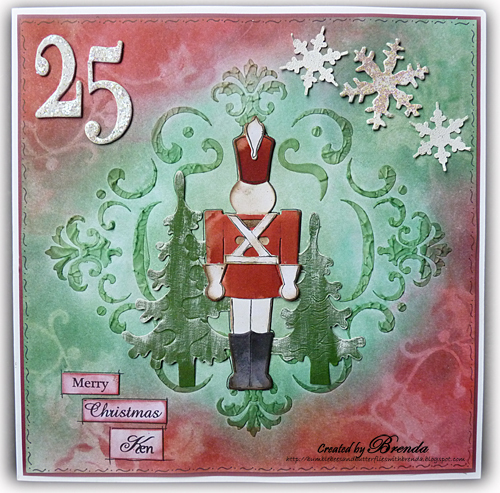 Fabulous card Brenda, love the background for your toy soldier. Glad to see you had a great holiday, the winter sun really gives you a boost before Christmas. Great to read that Becca is back to school and well. Love this card, the colour palette the toy soldier the trees the texture, gosh just everything; it is splendid. Wonderful textured background, and the soldier is a splendid highlight. Love your masking and colors! That toy soldier is perfect on this card! Just beautiful, Brenda! Love your masking and I always admire the way you work the pan pastels. I got the PP bug yesterday after seeing Donna Downey demo them. Santa's got a new addition to his wish list! gorgeous card, love the soldier on it, very english! Have a nice evening! Die traditionellen Farben sind immer wieder so schön anzusehen. Absolutely gorgeous Brenda and so clever to combine the 2 as well. Hope you had a fabulous time at the workshops, Andy is such a lovely guy and very inspirational too.